The leadership of the Castro Valley High School Interact Club made a brief presentation regarding their goals and activities for 2016-2017. 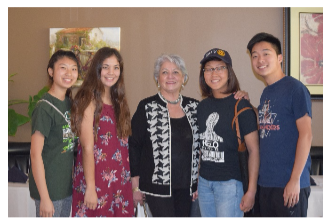 The Rotary Club of Castro Valley sponsors Interact Clubs at both Castro Valley High School and Redwood Christian High School. President Carol announced that the Club is contributing $100 for transportation costs to an upcoming District Interact meeting. District 5170 has the largest number of Interact members in all of Rotary International. Learn more about Interact here. Anna May from the Rotary Club of Hayward made a presentation on the upcoming District 5170 workshop on Saturday, August 27, at the Embassy Suites Hotel Milpitas – Silicon Valley, 901 East Calaveras Boulevard, Milpitas. The workshop is scheduled for 9:30 a.m.to 12:30 p.m. with refreshments at 9:00 a.m. Several club members have already registered. This will be a great learning event and fulfills a Red Badge requirement. See the flier for registration information. Our lunch speaker was Alfonso Valenzuela-Gumucio, owner of Antiques &amp; Eclectika in Dublin. Alfonso came to the United States over 20 years ago from his native Chili. He has a bachelor’s degree in Hotel Management and has 17 years of managing luxury hotels. He left the hotel industry to follow his passion for antiques and collectibles by founding Alfonso Estate Liquidations and Auction, but soon opened Antiques &amp; Eclectika. Due the high demand for liquidations by Baby Boomers, he decided to obtain his real estate license so he could provide a one-stop service for his clients.